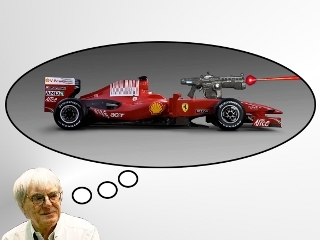 Random Perspective: Ecclestone Unveils 2010 Edition of "Bernie's Crazy Idea!" Bernie Ecclestone, the commercial rights holder of Formula 1, revealed his trademarked crazy idea for 2010 earlier this week following mass anticipation in the media, online web forums and the local TV store near to Ferrari President, Luca di Montezemolo. Ecclestone explained that every track should have several �short cuts� built on some of the corners that allow faster drivers to overtake a driver holding them up. Each driver would be allowed to use a shortcut five times during a race thus creating more tactics and more overtaking. Bernie�s Crazy Idea is set to become an annual tradition; in 2009 Ecclestone suggested a Medals system to determine the World Championship � an idea so crazy that most pundits agreed it would be difficult to top. However with 2010�s suggestion Ecclestone has demonstrated that there really is no limits to what he can imagine. Chequered flag to be replaced with a stunt ramp through a giant ring of fire. Drivers not allowed to sleep or go to the toilet between qualifying and the race. Middle stint to be driven by driver�s girlfriend. Champagne spraying to be replaced by paintball gun fight. Kudos points for drifting, handbrake turns and 360 degree spins. Viewers to telephone in and vote off one car every 5 laps. Nigel Mansell to make comeback.